New Year’s Eve morning I ran Brazen Racing’s New Year’s Eve 5K run held at Lake Chabot Reservoir in Castro Valley. It was a great event – completely sold out with a total of 1072 runners by my count of the results – that had three runs: a 1/2 marathon, 10K, and 5K. I had never been to Lake Chabot, but with a morning view like the one below and a clear and crisp morning, it was a good run day…and I will definitely run it again. This was my second Brazen Racing event and, like the previous one, it was very organized with a great staff and volunteer team. The expo area was nicely set up, food was great, and the SWAG was pretty good too. 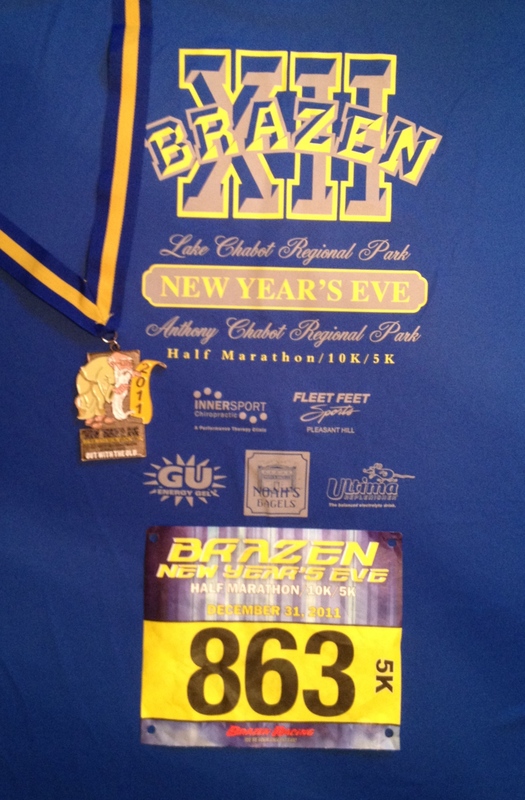 If you have not run a Brazen race, I highly recommend checking them out. I plan on running several of them in 2012. You can check out their calendar here – they have at least one race each month in the Bay Area with most on Saturdays. This was my fifth 5K since starting to run in September 2010. Needless to say, I’m hooked and having a ball! As usual, I got to the event early and kept warm in my car. I picked up my bib and timing chip and then took a short warm-up run along the lake. Close to the start times, I headed back to the starting line and watched the 1/2-marathon and 10K starts. I joined my fellow 5Kers – 339 in all – in the start pen and waited for the countdown and start horn. 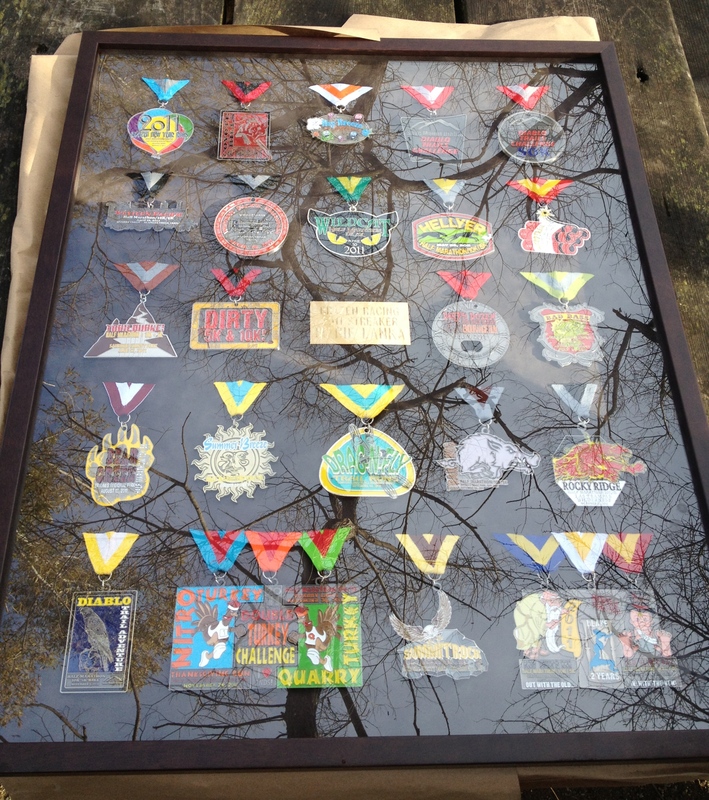 Before the start, they gave out an award to two 5K runners who had run in all 2011 Brazen races – dubbing them “streakers” and giving them the framed collection of 2011 race medals shown below…pretty cool! There were “streakers” in the other two races as well…as you can see, Brazen has quite a following. 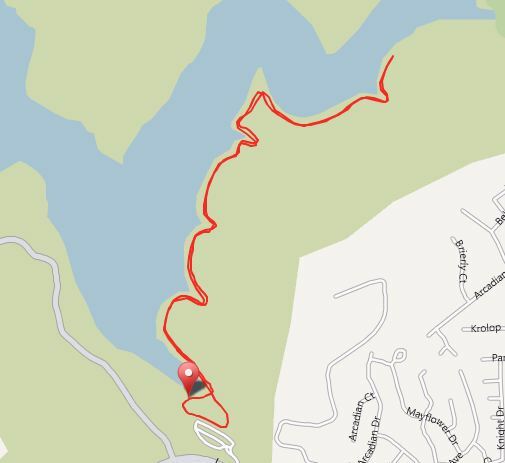 I hit my Garmin’s START button at 0907 and headed out for the out-and-back run along the lake. My goal for this race was to continue to keep my sub-30 minute time and keep my pacing on the hills (the 5K had about 4-5 short rolling hills.) At home, as I reviewed my Garmin data, I see that I ran splits of: 8:38, 8:58, and 9:07. They were close, though I see that I started a little fast. Given the hills, I’m sure I was just getting tired – though I pressed and ran through the hills keeping my cadence at an average of 96 for the whole race. I’m happy with my overall race though and see the pacing and hills as all part of the learning process of running – I seem to learn something new each time. Garmin time: 28:37 at an 8:51/mile pace. Official time: 28:48at an 9:17/mile pace. Happy with my results: remained sub-30 minutes, controlled my pacing, and ran through the hills. Brazen Races rock and will be one of my frequently attended events when planning my calendar. I started a 10K training plan on December 13th and my first organized 10K being Brazen Racing’s Bay Breeze on February 18th. I don’t really have any runs planned as of this post for January, but may do the Bay Area Track Club’s Test Your Resolution Road 5k on January 15th. Today’s session: 9 mi long run. Given the fact that I ran the 5K on Saturday (which is my normal off day), I ran the balance of the 9 miles today: 10K or 6.2 miles. Comments: Good run – ran the whole 10K in 59:25 at a 9:34 pace.